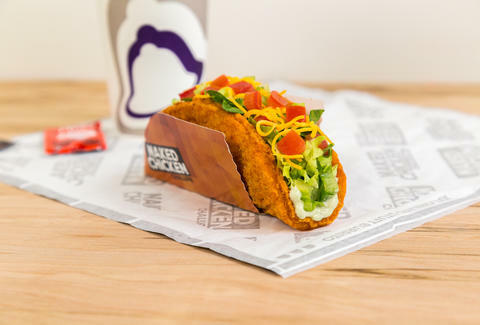 Although your stomach has only had a few days to contend with the nationwide debut of the Naked Chicken Chalupa, it looks like Taco Bell is already working on an all-new version of the innovative fried chicken taco. A 'wild' and spicier version, to be exact. Apparently, it's called the Wild Naked Chicken Chalupa and people recently started spotting it at Taco Bell restaurants in test markets like Lawrence, Kansas and Kansas City, Missouri, according to a report by Brand Eating. T-Bell appears to be selling the spicy version alongside the original, which has been renamed as the Mild Naked Chicken Chalupa on the test menus. Of course, the original Naked Chicken Chalupa already packs of bit of a kick, thanks to the layer of slightly spicy avocado ranch sauce. The only difference with the spicier Wild Naked Chicken Chalupa is that it comes with a new "Spicy Wild" sauce instead, per the report, which means you might not have to worry about grabbing a packet of Fire Sauce for it. Both versions, of course, feature the same 'naked' fried chicken shell, as well as lettuce, tomatoes, and cheese. We reached out to a Taco Bell spokesperson for more information. Tony Merevick is Cities News Editor at Thrillist and recommends using a packet of Fire Sauce or Diablo Sauce in the meantime. Send news tips to news@thrillist.com and follow him on Twitter @tonymerevick.